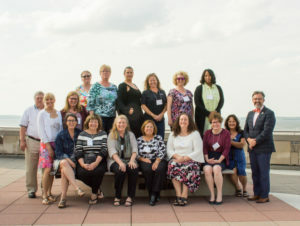 The 27th annual meeting of the SAIL Regional Group of IAMSLIC was held May 16-19 at the University of Wisconsin-Madison campus. Anne Moser of the Aquatic Sciences Center (UW-Madison) and Alisun DeKock of the Shedd Aquarium (Chicago) co-hosted the conference for 26 IAMSLIC-SAIL members, speakers, and guests. Madison welcomed us with traditional Midwestern weather – we needed shorts and t-shirts the first day, umbrellas the next, pants and jackets by the end. Spring weather aside, the conference kicked off with a Wisconsin-style BBQ dinner on Tuesday evening with a presentation and tour of the Aquatic Sciences Center. Wednesday and Thursday included two full days of excellent and informative conference sessions from members and guest speakers, the SAIL business meeting, and State of the Union–SAIL Libraries. 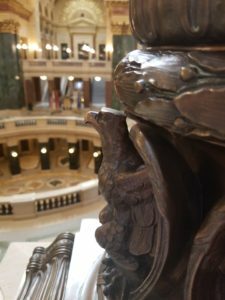 Thursday was capped off with a tour of the Madison capitol building by our most erudite local guide, Anne Moser, and a dinner “on the square” with a view of the capitol dome over local beer, freshly caught whitefish from Lake Michigan and, of course, cheese curds. The inside of “the people’s house” better known as the Wisconsin capitol building. On Friday, a smaller group remained in the city for a tour of the Aldo Leopold Center, just north of Madison. Leopold is considered by many to be the father of wildlife ecology and the US wilderness system. 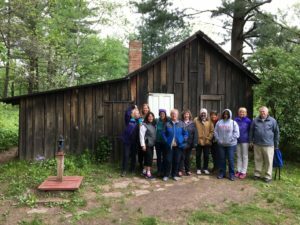 We were thrilled to visit “the Shack” where he did so much of his ecological observation and wrote many of the essays that comprise A Sand County Almanac. 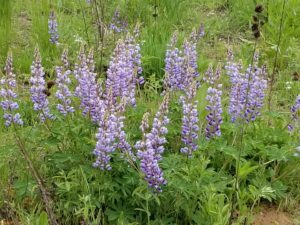 Lupins were in full bloom in Wisconsin! Many thanks to our sponsors Wisconsin TechSearch, UW Press, WT Cox, Springer Nature, DEMCO and ProQuest for their support of this year’s conference. Copyright © 2017 IAMSLIC News & Events. Powered by WordPress and A Dream to Host theme by Art of Blog.